Soaked in a world of color, Invisible Kingdom combines everyday problems with religious dogma and corporate interference. Set in a world that is both visually unfamiliar and yet instantly recognisable, the Berger Books Imprint of Dark Horse Comics challenges the readers understanding of the world around them. Vess gave up everything to follow the path of the Invisible Kingdom, including bitterly fighting with her parents who just couldn’t understand what she wanted to do. Now she has uncovered a shocking secret about the monastery and she finds herself doubting the very religion she sacrificed so much for. Alone and desperate who can she turn to? Captain Grix of the delivery ship Sundog has also discovered a secret, one which may determine her fate as well as that of her crew. Fearing that there is a spy upon her very own ship, Grix must make a difficult choice but time is running out as they head towards the head office of Lux. This issue is about comparing and contrasting not only the central characters but also the spheres they move in. 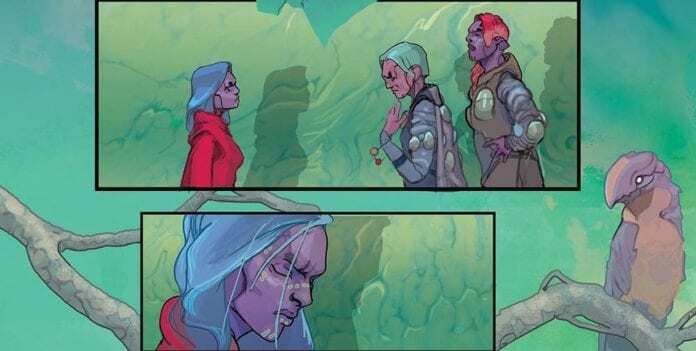 G. Willow Wilson has created two very different characters and put them in very similar situations. This enables her to use their personal dramas to compare the worlds of religion and corporate commerce. The two landscapes may at first seem very different, especially with the nuns rigid, despised lifestyle and the delivery crew’s wild adventures, but the problems that Vess and Grix end up encountering are the same. How they deal with them and how others in power react is where Wilson draws out the real drama. Her characters are sympathetic, each with a backstory not fully realised but containing an emotional hook that the reader can get to grips with. These are then surrounded by a small cast who serve their purpose. Wilson has crafted two separate worlds each with something to say but they are clearly on a collision course which is the driving force behind the comic. 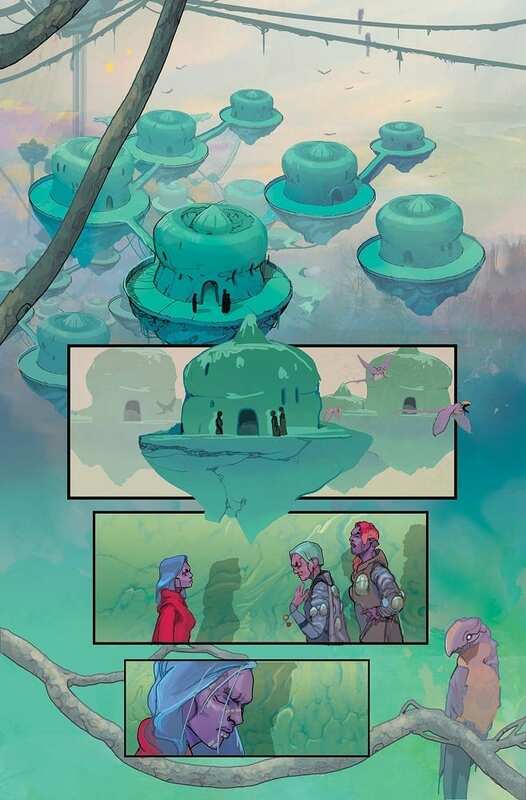 Both of the worlds in Invisible Kingdom have one thing in common, the sublimely beautiful art work by Christian Ward. He has produced exciting, alien landscapes that fill the page. Small details appear throughout the panels, unrelated to the story but set the scene perfectly. An obscure looking bird perched on a branch in the bottom of the page is a reminder to the reader that these worlds are different only in appearance; beneath, as the narrative confirms, there is much that the reader will identify with. Ward’s design work is exceptional and the colours are striking, continuing the theme of contrasts set out in the narrative. The bright red of the nun’s habits are like a sea of red weaving through the cold blues and white of the monastery. In contrast the Lux headquarters is awash with neon whereas the characters are reduced to dark colors and are shrouded in shadows or reduced to silhouettes. Ward’s art tells the reader all they need to know about the institutions that rule in the Invisible Kingdom; the corporation is glitzy and showy and rejects the people whereas the monastery focuses on the people while neglecting the world outside. Sal Cipriano’s lettering is subtler but equally effective. The caption fonts match the alien-ness of the world, a constant reminder to the reader where the story takes place. The placement of the speech balloons fills voids in the background relieving the panels of any dead air. However, for intimate conversations Cipriano clusters the balloons together, as if the characters are speaking in hushed, tones. The narrative continues to be intriguing and the characters are growing at a steady pace. Wilson draws out her cast a little bit in each scene so that nothing too much is given away but the reader is always satisfied. Ward’s Artwork is outstanding and warrants attention without the surrounding narrative. There is a lot on offer in the pages of Invisible Kingdom; character, mystery, metaphor. However, none of it over powers anything else: it all sits together on the page in equal measure. This is proving to be a must read comic and the future prospects are huge as there is a vast world of ideas for the creators, and the readers, to explore. 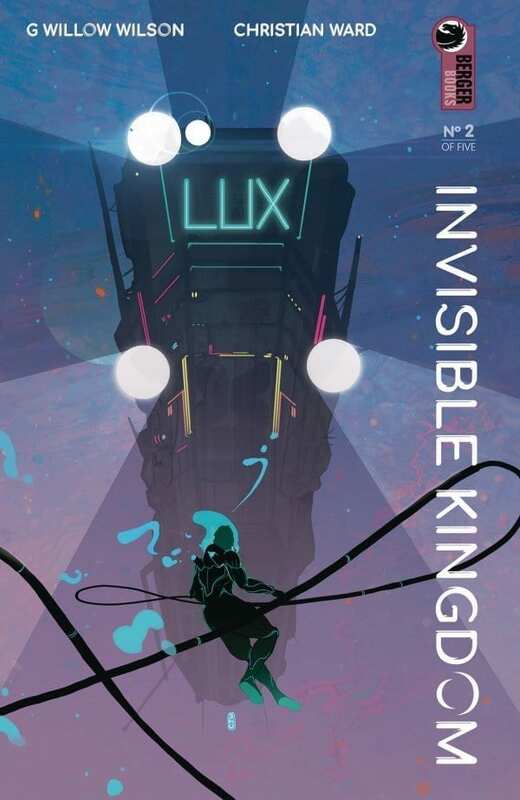 Invisible Kingdom #2 is released on 24 April 2019.